Excuse me, internet. What is with the death-to-summer attitude? The plaid-sweater-wishlisting, suede-bootie premiering, baked-apple-pumpkin ridiculousness all up in you this week? Just slow your roll, internet. I mean, I like cider doughnuts just as much as the next girl, but get it together! It’s totally still summer. Today counts as summer! Who’s with me? It’s hot out, and there are still stone fruits at the market. Can’t we hang on to this for a few more weeks, please? Pretty soon even I will be overflowing with words of praise for hot tea and apple cake and football, but not yet. Not yet! 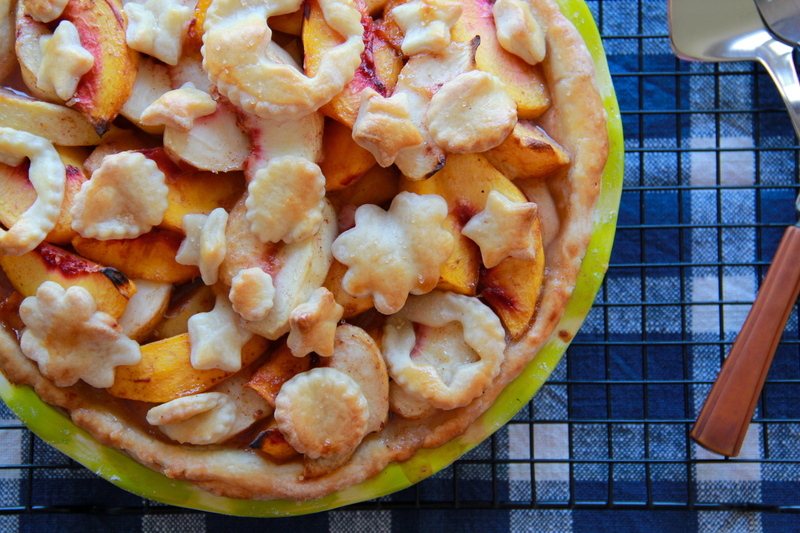 Let’s make one last peach pie. Let’s dress down and take our shoes off. Let’s dine outside! We can serve our pie with cold and melty ice cream. We can make it last. This recipe is a mashup — it’s part Jumbleberry Pie, and part Cornmeal Peach Cobbler. A great mix, in these Indian days of summer. To make the pie crust, dump the flour, salt and sugar in the bowl of a food processor fitted with the steel blade. Pulse for about 5 seconds to combine. Add the cubed butter and pulse about 10 times, until the butter has been processed into bits of various size. With the motor running, pour the ice water down the feed tube and continue to pulse until the dough starts to come together. Transfer the dough to a floured surface and gather it into a flat disc (it will be a bit wet and sticky – flouring your hands will make it easier to shape). Wrap it tightly in plastic wrap and chill for at least 1 hour in the refrigerator (or about 30 minutes in the freezer). While the dough is chilling, gently toss peaches with sugar together in a large bowl and let sit for 5 minutes — the peaches will release some juices and become syrupy. Drain peaches in a colander over a bowl and reserve 1/4 cup of the juice (you can throw out any remaining juice, or save it to use in a cocktail or something). In a small bowl or measuring cup, whisk together the reserved peach juice, lemon juice, cornstarch, salt and cinnamon until smooth. 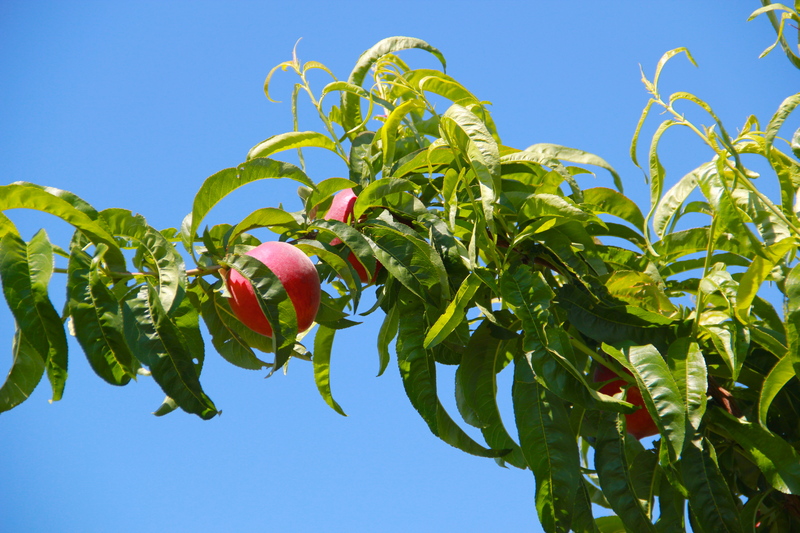 Mix peaches and juice mixture together in a bowl, and set aside. Once the crust is well-chilled and firm, remove the pie dish and the smaller piece of dough from the refrigerator or freezer. 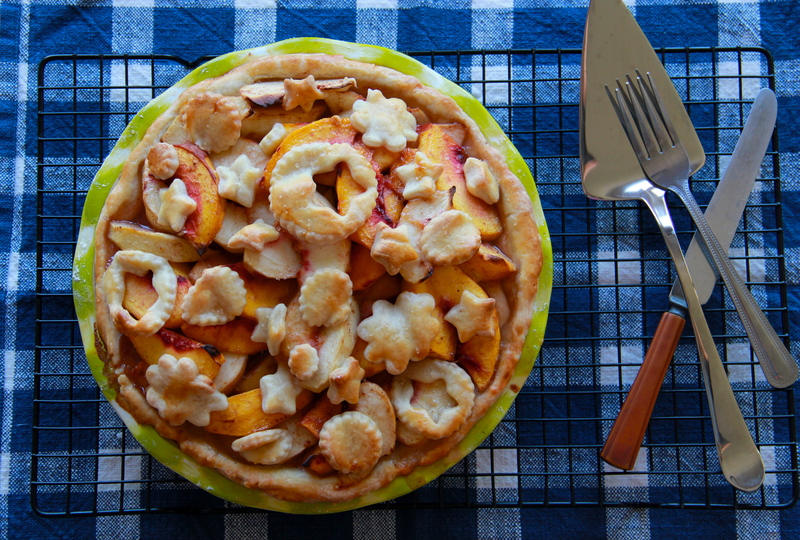 Pour the peach mixture into the pie shell, and set the pie aside while you prepare the decorations. To decorate, roll the small piece of dough out on a well-floured surface to about 1/4 to 1/8-inch thick. Use small cookie cutters to cut out shapes (I like circles, stars and flowers), and lay them gently on top of the berry filling. Brush the shapes and the crimped crust with egg wash, and place the pie on top of a large sheet pan (to catch juice drips). Bake the pie for about 1 hour, until the peach juices are bubbling and the crust is a deep golden brown. This weekend. This girl. This pie. Please?